Despite his familyâ€™s baffling generations-old ban on music, Miguel dreams of becoming an accomplished musician like his idol, Ernesto de la Cruz. Desperate to prove his talent, Miguel finds himself in the stunning and colorful Land of the Dead following a mysterious chain of events. Along the way, he meets charming trickster Hector, and together, they set off on an extraordinary journey to unlock the real story behind Miguel's family history. Pixar is the best at what they do. They consistently put out quality material and Coco is no exception. 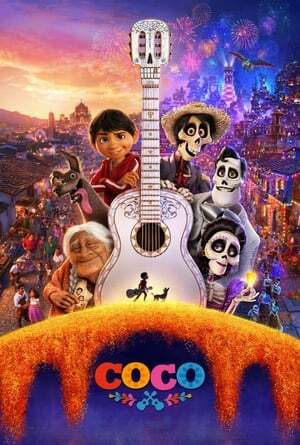 This time we have a story of a Mexican boy who longs to pursue his dream of being a musician against the wishes of his family who come from a legacy where music is considered a root of bad things. Pixar deserves a huge pat on the back for bringing in an all Latin cast to fill the roles. With the huge success of Coco, hopefully other studios can follow suit. All that aside, don't miss out on this one. The visuals are gorgeous, the music outstanding, and the story a real heart tugger.